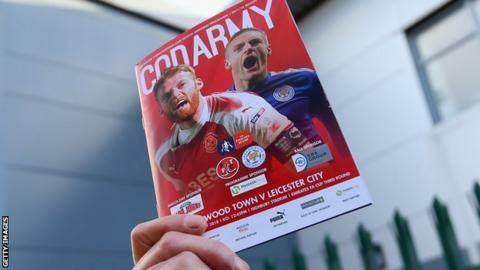 Some EFL clubs want to stop printing match programmes for every game. The Football League has been asked whether publishing one for each league match should continue to be a requirement next season. Clubs are concerned about declining sales and increased costs and will vote on the issue at their meeting in June. The EFL will continue to produce programmes for all its major games, including the Carabao Cup final and all three play-off finals. Collecting programmes remains a popular hobby, with six fairs being held in England and another in Northern Ireland, during May. There are many examples of programmes being sold for sums in excess of £1,000. In 2014, a copy of the 1901 FA Cup final programme between Tottenham and Sheffield United was sold for £19,000 at auction. Fancy a pint in The Royal Dyche?